Talvor is a relatively new motorhome brand created by a privately-owned Australian company, which has been building motorhomes for Apollo Rentals in Australia (and more recently New Zealand) since 1985. 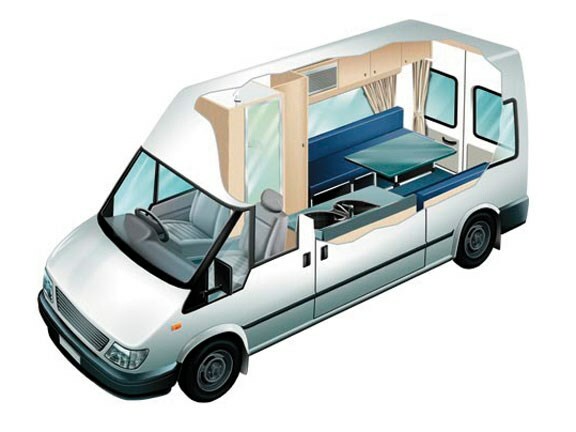 The Talvor range of motorhomes was launched in the Australian market in 2006. Since then, a small but increasing number have been imported into New Zealand. 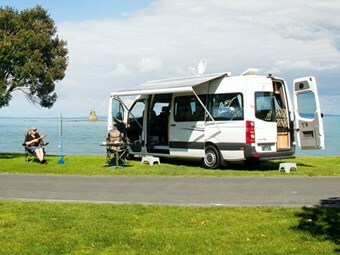 Having tested the market, the company opened a manufacturing division here in New Zealand in May 2010 and began building Talvor motorhomes for the retail market as well as for the Apollo rental fleet. Here, the company currently builds a range of models using Mitsubishi L300 vans, Toyota Hi Ace vans and VW Crafter vans, as well as VW Crafter cab chassis for both the rental and retail markets here and in Australia. The all-new Talvor Euro Tourer reviewed has a furniture fit-out manufactured in New Zealand and installed in the long wheelbase (LWB) version of the VW Crafter at the Talvor facility in Mt Wellington, Auckland. The layout is one of three options, with a 'combo dinette' at the front, a toilet/bathroom opposite the kitchen bench amidships and twin settee berths at the rear. Another option replaces the twin berths with a permanent double bed that has access down one side. The third option moves the toilet forward in place of the dinette, with a full-height wardrobe cupboard and a bench-high cabinet alongside opposite the kitchen bench, with twin settee berths at the rear. This third layout option is standard for the rental fleet. 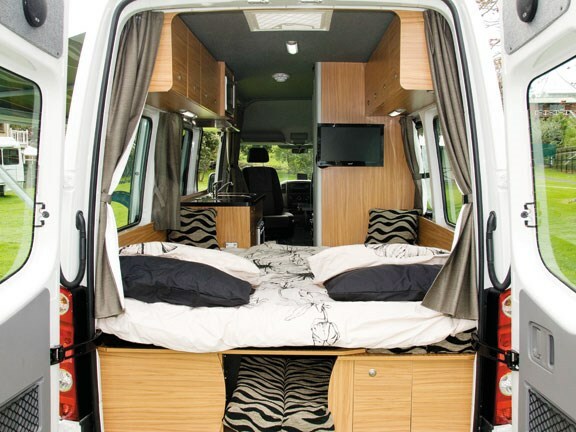 Talvor might be an Australian company but the Euro Tourer is most certainly a New Zealand-built motorhome. I took the Euro Tourer for a short jaunt down the undulating Whangaparaoa Peninsular to the photo shoot location. It was enough to confirm my previous favourable impression of the Crafter. Powered by a five-cylinder 2.5-litre turbo-diesel engine with an six-speed automated manual transmission (AMT) gearbox, it is agile and responsive and deals with all the challenges open-road and city driving can throw at it. Visibility both forwards and to the rear is excellent, so I quickly felt confident that I knew where all four corners of my vehicle were in relation to others on the road. User-friendly features like 'auto headlights on' when driving, cruise control, reversing camera, climate control aircon, central locking, twin front airbags and the redesigned front seats reflect Volkswagen's concern for driver comfort and safety. Throw in ADS (antilock braking system), ESP (electronic stabilisation program) and TCS (traction control system) and you can take to the road in the knowledge that Volkswagen has gone out of its way to protect you from both driver miscalculation and hazardous road conditions. Clever utilisation of space starts in the cab of the Euro Tourer. Rotate the cab seats to face the passenger seat located behind the driver's seat and you have cosy lounge seating for three. Mount the table on the versatile Lagun wall bracket between the seats and create a breakfast bar, coffee spot or happy hour retreat. The locker above the dinette houses the instrument board for systems and appliances. These include a 10-amp regulator for the 85-watt roof-mounted solar panel; Talvor's own custom-made 12-volt stereo entertainment centre, with a radio and connectivity for iPods/iPads and various other MP3 players but, sign of the times, no CD player; controls for the Truma gas water heater and Propex space heater; a BEP switchboard and battery volt monitor; and fresh and grey water tank monitors. The vehicle reviewed was fitted with a manual Winegard satellite dish and a 19-inch LED flat screen TV, with satellite freeview as part of the package. If you are entertaining more guests than the front lounge can cope with, there is an alternative dining area available. A second Lagun table bracket with a larger table is mounted on the rear wall of the kitchen bench unit. With this table set up between the settee berths, diners will have much more elbow room. When parked out of the way, this table becomes an extension to the kitchen bench – very handy when washing the dishes or preparing meals. Not that the kitchen bench is small. Considering the size of this motorhome, it is generous. A Smev combination three-burner gas hob/sink unit is set into the bench top. The microwave is mounted between the two overhead lockers over the bench and a range hood is fixed under the locker directly over the hobs. Beneath the bench is a 12-volt Waeco 83-litre fridge with a freezer compartment. These Waeco units, with their Danfoss compressors, are some of the most efficient 12-volt fridges around, so with the 85-watt solar panel pumping amps into the batteries, keeping the beer cold shouldn't be a problem. Limited food storage space in the kitchen cupboards, lockers and drawers means you will have to use adjacent lockers and the space under the settee berths if you are stocking up for a week of freedom camping. However, this is a tidy, well-executed kitchen, in keeping with the size of the motorhome. The toilet/bathroom is not lavish, but is perfectly functional. It has an easy-clean fibreglass lining and moulded shower tray. The Thetford 17-litre swivel toilet cassette is removed for disposal through an external access hatch. I liked the substantial wall-mounted shower but did wonder about the lack of a hand basin as part of the standard fit-out. Paul Cook from RnRV told me not to fret. "It's not a problem to fit one if that is what the customer wants," he says. "Leaving it out gives more room in the shower, so it depends where the customer's priorities lie as to whether or not we fit one." 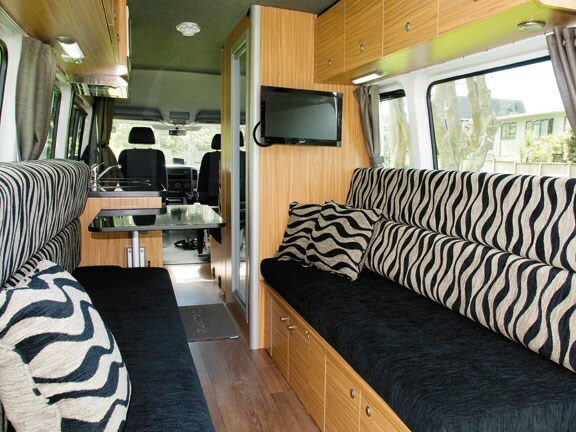 The twin settee berths that make up the lounge by day and beds by night is the layout most frequently seen in van conversions like the Euro Tourer. And there is good reason for it: this layout has stood the test of time because it works. At night, it can be used as two single beds or made up as an enormous playpen. During the day, it provides twin settees for sitting or snoozing. It allows easy access through the rear doors or, should the weather turn cold and gloomy, they can be closed off to create a warm, snug space. Manufacturers use the space under the settees to mount appliances and other essential equipment and motorhomers use the rest of the space for all sorts of important stuff. Other fancy layouts will come and go but this one will remain the all-time favourite. Talvor has used durable melamine-surfaced board for longevity, with comfortable cushions and generous overhead lockers. There are sufficient lights for reading and food preparation and the decor (by Paul and the RnRV team) strikes a careful balance between being distinctive but not overwhelming. This kiwi built product will definitely give the imports a run for their money. It has an air of practicality and robustness that will appeal to many kiwi buyers. 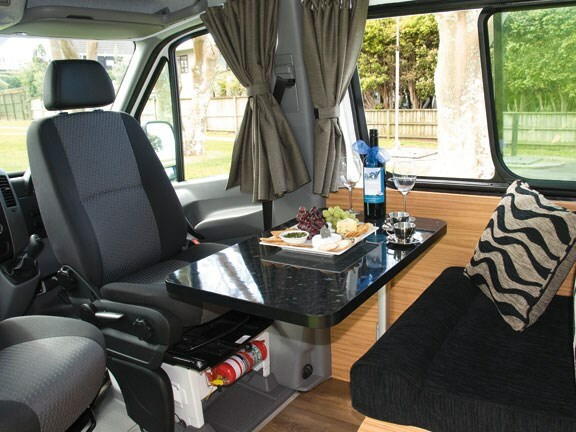 The Euro Tourer as reviewed has had a series of upgrades as requested by RnRV: removal of the AC unit from the living area, addition of an 85-watt solar panel, Winegard satellite dish, freeview decoder, custom soft furnishing, cabinetry and bench top colours and full insulation. With these upgrades, RnRV retails the vehicle for $118,990 (inc ORC and GST). For more information, ph 0800 767 808 or visit RnRV.co.nz.